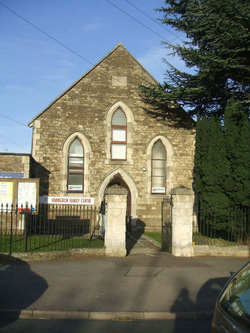 Baptist Church - Faringdon Community Website. 1657 is regarded as the official foundation- with Faringdon worshippers from Faringdon to stand up as a distinct church, but Baptist handbooks of the 19th century refer to them meeting together or attending churches in neighbouring villages from 1530 or from 1570, though the sources of the information are uncertain. A staunch supporter of the church and a helper of Richard Steed, Philip Farmer, in 1711 donated a copy of the works of John Bunyan, including the Pilgrims Progress. He stipulated that it should be 'for the use of all, whether members of hearers, as shall resort thither at convenient seasons to read it' and that it should not be removed from the meeting house so long as this was in use. It was removed 50 years later for safe keeping. In 1888 the book was returned by Mr John Broad, a deacon of Kings Road Baptist Church Reading. During the 19th century more pews were added, an enlargement in 1818, repairs and alterations in 1852 and1878, and the purchase of a harmonium in 1866. This church also supported Little Coxwell, Buscot and Kingston Lisle. A link with Lechlade was established in 1883, with a union of the 2 churches and preachers being provided from Faringdon. Charles H Spurgeon, a famous preacher, presided at the church's anniversary in 1885. Dr John Rippon's selection of hymns from the best authors, known as Rippons selection, was used in Faringdon. Dr Isaac Watts, the early 18th century writer, is said to have preached at Buckland. Faringdon was highly regarded. When the pastorate became vacant in 1902 there were 30 applications.